Whether you manage the property or head up housekeeping, you know how important it is to keep your assisted living facility sparkling clean. Bright, fresh rooms are critical for the health of residents as well as visitors and staff. It’s always a good idea to review your general cleaning guidelines and reset schedules as needed. This nursing home housekeeping checklist is designed to provide a base for building a template tailored to your facility. This housekeeping duties checklist for senior care settings is divided into three sections with daily, weekly and monthly recommendations. The guidelines apply to residents’ rooms as well as facility-wide spaces such as common areas, dining rooms and bathrooms. These daily guidelines help ensure a healthy environment throughout your elderly care home facility. Avoid exposing residents to harsh chemicals by using mild disinfectants for general cleaning. • Wipe down all surfaces in individual rooms and shared areas several times a day. • Disinfect touchpoints including door and cabinet handles, handrails, light switches and shared electronics. • Sweep and mop hard floors, vacuum carpets, and inspect door mats for signs of wear and tripping hazards. • Keep kitchens free of dirty dishes, wipe down appliances, and check refrigerators for spoiled items. • Clean and disinfect bathroom showers, tubs, whirlpools, sinks, countertops and toilets. • Secure all dirty linens in heavy, fluid-resistant fabric bags, and move to the laundry room in covered linen carts. • Tie trash bags before removing from receptacles, and be alert for any tears that might spill contents. Stay ahead of big cleaning jobs in an assisted living facility with weekly housekeeping duties. These projects also provide opportunities to confirm the condition and safe operation of doors, windows and light fixtures. • Vacuum furnishings and cushions, wash drapes, and clean window blinds. • Dust light fixtures, and check bulb type and wattage to confirm safe use with each fixture. • Clean out and straighten up kitchen cupboards, refrigerators, pantries and general supply storage areas. • Polish windows and sliding glass doors inside and out as well as interior door windows and glass room partitions. • Clean wood and metal doors, and check hardware, door stops and lock mechanisms. • Inspect sink and floor drains in bathrooms and kitchens for clogs or signs of mold and mildew. Work with staff to outline monthly cleaning projects in your senior living facility. Addressing these jobs on a routine basis makes it easier to keep up with daily and weekly housekeeping duties. • Thoroughly clean inside cabinets and pantries, and clean kitchen appliance interiors. • Check food in refrigerators, cabinets and pantries for freshness and expiration dates. • Clean overhead light fixtures, ceiling fans and fire sprinkler systems, and check smoke alarms. • Wipe down walls and baseboards in all rooms with an eye out for any signs of dampness from hidden leaks. • Clean ceiling and wall air vents and grills, and change out HVAC filters. • Steam-clean carpets and area rugs, and wax and buff hardwood floors. It’s often more efficient to outsource big cleaning projects. Hiring a cleaning company saves the expense of renting equipment and buying specialty products. It’s also safer to leave heavy jobs in the hands of industry-certified professionals. These are just a few of the benefits of bringing in an experienced cleaning contractor. • Professionally cleaned furniture keeps interiors fresh and prolongs the life of fabrics and frames. • Carpet and rug care includes deep cleaning and stain protection treatments specific to fiber and padding types. • Tile counter, floor and wall cleaning includes deep grout disinfecting. • Professionally cleaned air duct systems help maintain healthy air quality throughout your nursing home. • Green cleaning, customized scheduling and one-time project options are all available. 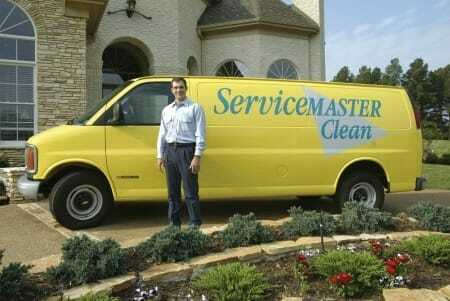 • In case of fire or water damage, you can depend on a full-service cleaning company for restoration services. Every assisted living facility presents unique housekeeping challenges. As you update procedures and rework staff schedules, we hope our guidelines can make your job a little easier. We’re glad to help with a full line of certified nursing home cleaning services. You can depend on ServiceMaster by Zaba to support your staff’s hard work, and we’re here for emergency situations too.